Harvest Bible Chapel’s former long-time elder Dave Corning releases public letter to expose Pastor James MacDonald of abuse of power, lack of accountability, and personal financial gain. Holy Moly, that’s a lot of Twitter followers! When reading this blog post, please consider how many people are and have been affected by Harvest Bible Chapel’s Pastor James MacDonald! I have to say, I took in a deep sigh when I read this letter. And then I e-mailed the guys at The Elephant’s Debt (TED) blog seeking permission to copy the letter here so we could discuss it. Permission was granted. When looking at spiritual abuse, I’ve said a number of times that it seems like all spiritual abusers go to a Creepy Spiritual Abuse School (CSAS) because they all behave the same, follow the same abuse patterns (they abuse their power, lack accountability, etc), use the same defense mechanisms, twist the same Bible verses. Their behavior really is predictable. This is probably the “best” letter I’ve read that uncovers so many aspects of abuse in such a clear fashion. It should be sent out far and wide as a teaching tool on spiritual abuse. I applaud Dave Corning for his powerful public statement. This statement gives credibility to the many elders who have already left as well as validates many who have been confused. It is so important to expose the truth. The sad reality, which I mentioned to Ryan at The Elephant’s Debt, is that much harm is done to the Body of Christ when there is spiritual abuse. Spiritual abuse leaves people confused, not knowing who to trust. Some will defend their beloved pastor, some will start questioning. Some will feel betrayed by a man who was supposed to be their godly shepherd. This is one big mess and the spiritual ramifications may never be known. We know the fallout. We’ve seen it. The most heart-wrenching part of spiritual abuse is what it does to one’s faith. Some may doubt their faith or even have a crisis of faith because of spiritual abuse. Next postSpiritual Abuse: Harvest Bible Chapel – Should Church Members Stay or Leave? Um, maybe backup for Black Sabbath? There are three things that men in the ministry are constantly subjected to: Pride, women and money. The enemy seeks to trip up men with these things. Truth is, however, that what they become is what they were all along. A thief has always been a thief; his crime simply betrays what he has always been. And the danger of pride is that it makes you blind to your sin, so that you eventually believe what you are saying and doing is right and good. “He hides his full income because it is beyond explanation to those who are sacrificially paying for it.” The true mark of a hireling. Ezekiel 34 addresses this in a sobering way. “These actions are the result of James’ continuing pattern of using and abusing people.” Cults use the same tactics: Fear and Flattery. Those they cannot control through flattery, they seek to control through fear. Jesus addressed the rot of the problem in Matthew 24:48-51: “But if that evil servant says in his heart, ‘My master is delaying his coming,’ and begins to beat his fellow servants, and to eat and drink with the drunkards, the master of that servant will come on a day when he is not looking for him and at an hour that he is not aware of, and will cut him in two and appoint him his portion with the hypocrites. There shall be weeping and gnashing of teeth.” (NKJV). These words are sobering, as they are the words of Jesus. If they were the words of man, one could argue with him. But since they are the words of Jesus, one would be wise not to argue with Hm. Dave Corning and his wife are paying the price for integrity. The friendships they lost, however seemingly sincere, were in fact insincere, proven by the fact that their “friends” have turned their backs on them. Their pain is very real. It is like a death in the family. It gets easer to deal with, but they will never get over it. (Unfortunately, my wife and I speak from experience). For the “celebrity” pastor, I would hate to be in their shoes. There is an accounting coming, just as Jesus said. Perhaps in this life, perhaps not. But it is coming and it will be terrible. I’ve followed Pastor James for years, listening to his messages on a local radio station. I noticed a few years back, around the time of the Elephant Room, that he started putting more and more work into refining his image. No longer was he this goofy looking bald guy, but now he was better dressed and seemed to permanently grow and color his goatee. I figured he must have gained an image consultant or some such. Anyways, I went drove 2 hours to attend a Vertical Chuch tour meeting just for a chance to see him in person last summer. I was so excited. My wife and I arrived very early and waited for the doors to open. We were able to sit in the front row! I couldn’t wait to see one of my Christian heroes in action. The message was good although he did go on about supporting his ministry a bit longer than I would have liked (I had already committed and sent Walk in the Word a few hundred dollars). At the end, I couldn’t wait to meet Pastor James, and have him sign my copy of Vertical Church. When I did get face to face with him, along with his wife, it was a complete disappointment. He did not seem to want to make eye contact with anyone. He kept his head down and gave me the signature I had, up until that point, so badly desired. I walked away with mixed feelings. Was it me? Did he condemn me because in my excitement I had forgotten to bring my Bible? A man of God who was one of my spiritual role models did not have time to as much as smile at one of his devoted followers. But it was more than that… there was a feeling of… an ego.. pride… at the time it was hard for me to understand. Now, hearing this story… it fits. He wasn’t who I thought it was. I couldn’t even bring myself to read his book after our encounter. I passed on teaching his small group studies in my church. It was obvious to me that something was wrong. I thank God for revealing it to me at the time. I will pray for James, and I hope you all will too. He can repent and with prayer and time I have no doubt the Lord can restore in him a true servant’s spirit. God bless you all. Sanctified Daily: Welcome to the blog and thank you for sharing your experience. Image control is a common concern for those who are high-controlling church leaders. It is about pride and arrogance. Your story about not making eye contact is very revealing. I have always been convinced that if someone cannot look at you in the eyes, they are hiding something. I’m glad you are piecing these crucial signs together. You’re right. We need to continue to pray for MacDonald and his church. There are so many people who are affected by this man. Has anyone on this forum, particularly the blogger, ever spoken with Mr. MacDonald personally? I do not attend this church, I know none of the parties, and I have no skin in the game. Even if what Dave Corning said is true, I cannot find any evidence that Christ would want us handling it this way in the name of “warning” everyone. This looks a lot more like gossip to me. If anyone here has a problem with James MacDonald, they (like Mr Corning) should follow Matthew 18 and approach Mr MacDonald in private. Of course Matthew 18 addresses when a brother has sinned against YOU, not someone else. This elder already took it through the appropriate biblical procedures. I have another post in which you can read the very public words of MacDonald in which he professes that he and his elders are mediators for God. That is completely against scripture. God’s word clearly says that only Christ is our mediator. MacDonald is a false teacher using his position of authority inappropriately. Yeah, Dave, like JMack would give anybody here the time of day if we tired the Matthew 18 thing–which doesn’t apply to the situation you’re addressing anyway. I’m sorry, but when religious leaders use their fraudulently claimed authority to the hurt of others, they have in my opinion placed themselves in the same category as the religious leaders of Jesus’ day, and Jesus called them out very publicly. And it wasn’t gossip. And Jesus called them things like wolves. And pigs. And snakes. And whitewashed tombs. Maybe I missed the part where Jesus first privately approached these wolves/pigs/snakes/whitewashed tombs. Maybe I missed the part where Paul approached Peter privately before very publicly calling him out. If so, the burden of proof is on you, Dave, to show us where. Dave, are we not called to seek justice for the oppressed? If you don’t like how we contend for “the least of these,” how would you do it? For whom do you have a heart, Dave, these mega-so-called-pastors or people like Julie Anne who, along with her daughter and others, got sued for half a million dollars by her former so-called pastor? No, I will continue to warn against wolves. Now that I think about it, The Matthew 18 procedure only applies as between sheep. Wherever did you get the idea, Dave, that sheep or shepherds are required to first go privately to the wolves before sounding the alarm? I couldn’t think of a better strategy for getting eaten alive. No thanks! I do have some scriptural “warnings” for believers – If you would like to see them? Dave – Why didn’t you, Dave, approach SSB in private? Julie Anne nods her head in agreement with Amos. Wolves? Spirtual Abusers? Hyper-Authoritarian pastors? but within they are full of extortion and excess. I am being attacked by people from my church Harvest Niagara for questioning James MacDonald and his friends! Why are so many churches in Canada, the U.S. and around the world not using discernment? WOW! Regardless of what James’ actions are, this is not the way to handle this. Amazing that we always point out the speck in our brothers eye and fail to see the beam in our own. This in no way furthers the gospel to anyone. I am in no way connected to this but just stumbled on this as I was researching a sermon I heard online. You all should be ashamed of yourselves. Anyone that may have been saved in this church may now be questioning their salvation because of your actions. It is not our responsibility to judge or talk about this. This does nothing to promote the Gospel of Jesus Christ. I am a deacon at my church and it goes the other way too. Too many church “leaders” have an agenda and when the pastor doesn’t do as they please, they rip him for many years before leaving. If you’re not happy with the way a church is run… just leave. Don’t gossip or slander… we’re not called to do that. It’s our responsibility to follow our Pastor as he follows after Christ. If you don’t feel he’s doing that, then leave and find another church. But instead, since we’ve been there for years we feel a sense of entitlement and “we won’t leave, he needs to change”. As I’ve been fond of saying, if you don’t like the direction our pastor is taking… “we’re not asking you to leave church, just this church”. How many people have been permanently damaged by people who just won’t leave and go somewhere else. “But why should I have to leave, I’m not in the wrong and this is my church”.. has ruined many a church. Okay – How about if we “reprove” and “rebuke” with ALL authority? The unfruitful works of darkness? On a public blog, that others also may fear? These things speak, and exhort, and “rebuke” with all authority. Them that sin “rebuke” before ALL, that others also may fear. “It is not our responsibility to judge or talk about this. Is it your responsibility to “judge” the folks here? Seems you only mentioned Jesus “once” in your 287 words. Why did you NOT follow your own advice? 2 Questions. Did you read Mr Corning’s letter? If you did, who would you conclude slandered whom? This is just not a topic that should be on the internet. Period. Reprove and rebuke should not be done a public forum. The bible clearly speaks that if you have an issue with your brother you are to go to them in private. If they won’t listen you take a witness, if that still doesn’t work, then you bring it be your church. There must be a different version that states #4 go to the internet… And before you say “you didn’t do that” there’s no way for that to be done directly on a blog website. The response stated was not an attempt to slander anyone on this blog. As you read through the post, did it once ever cross “your” mind that “Mark’s trying to tear down a church or a pastor”. Oh, that’s right, that goes against the attempt of the masses on this site… There’s no need to judge when it’s all right above for all to see. What exactly are others “fearing”. An opinion of those that are not directly involved in this situation? That sounds like a great idea. And in response to your “self glory” comment, this is just an underhanded response to discredit my post. In fact, you used “I” at least 17 times in your previous posts… Just sayin’… Maybe the course of action should have been to pray for the discord that is apparent in this post. “My” bad. Just to keep from becoming righteously angry, the browser will soon close and this page will not be visited again. How’s that for a post not using “I”. 1. Yes, I did read the letter. 2.This is only one side of the story from someone who may have an axe to grind. There’s no way of knowing who is slandered whom. Sure sounds like it’s you’re “responsibility to “judge” the folks here? Does that statement promote the Gospel of Jesus Christ? And, how does that statement promote “building up” and “Give Grace” here??? If you really believe “the Law’ you place on others? How come you do NOT come to me in private? If you have an issue with me? …but do not ye after their works: for they say, and do not. Is that in the Bible? Who told you that? Are you adding to the scriptures? Do you Qualify to be a “Deacon?” Those are some tuff Qualifications – Yes? NOT one of His Disciples called themself pastor, or leader, or reverend? NOT one of His Disciples had the Title/Position pastor/leader/reverend? Where in the Bible does it say WE, His Body, His Sheep, His Disciples; Are to Follow a Mere Fallible Human who takes a Title that belongs only to Jesus? Jesus said, MY Sheep – Hear MY Voice – and Follow me – Jesus. John 10:27. NOPE – NOT underhanded at all. Marked by or done in a deceptive, secret, or sly manner; dishonest, sneaky. NOT deceptive, or sneaky, or in secrete. NOT underhanded. You did the very things you told the commenters at SSB NOT to do. I just helped you, and others, to see – the Hypocrisy of your statements. Hypocrisy is the state of falsely claiming to possess virtuous characteristics that one lacks. Hypocrisy involves the deception of others and is thus a kind of lie. Hypocrisy is not simply failing to practice those virtues that one preaches. We are called to admonish one another – Warn one another – Yes? The scripture says “take it to the church”, not a church, not the local church, but “the church”. When a pastor is so much in control that he can dismiss elders, the venue cannot be in the church the pastor controls, it must be the the larger body, the church at large. And that is what is being done in this instance. Dave had already left the “localchurch” and gone away all quiet – like, just as Mark recommends, before much of the mistreatment he alleges. AND he had already gone privately and with others. His next option might have been the church as a whole in the Chicago area– if there were any cooperation among protestants, but there would be no hope the alleged sinner would listen. He could go to the denominational apostle or bishop or presbytery or convention or ?? But the alleged sinner is THE SOLE DENOMINATIONAL AUTHORITY! So, although the Internet may not be ideal– it’s POSSIBLE the alleged sinner might listen– it’s an assembly the alleged sinner utilizes EXTENSIVELY (even to *discipline* other former elders). life, and this includes looks, appearance and personality. This is a shocking statement to some, however, said their schools did not have one in place to deal with your shy date. a man feel like a man. As a former eleven-year attender of the main branch of Harvest Bible Chapel in Rolling Meadows followed by a move to one of the satellites, I can say that easily the last three years I was there my gut was telling me that something was off. The message and the messenger were sending mixed signals. When I first began attending HBC, I was a single mom. I ran into financial difficulties and was referred to the benevolence ministry who in turn rebuked me for my irresponsibility with my finances. (I had been a stay at home mom who was married to an abusive, alcoholic who up and disappeared, finances and all). Today, I find myself infuriated that I faithfully tithed to a “church” that went gambling with my pennies that could have fed my children. As a single mom wanting to raise godly children, I sent one of my children to the Michigan camp regularly. Finally, on year three she told me to stop. She said no one is “saved” but ministry leaders put so much pressure and shame on the kids to claim a newfound faith. She said she wished I could hear the adults leading the camp and claimed it was a cult of verbally abusive leaders. I also served on a ministry team and it was in that role that I first noticed the communication between satellites and the main campus was non-existent if not antagonistic. In this ministry, I also noticed the tenets of Humanism creeping in and I showed leaders of this ministry the proof. What they did was reduce my role in the ministry until I was silenced and I eventually dropped from the ministry. Small groups are an important part of Harvest and I was in one of the women’s groups. Multiple times, I brought my concerns to my small group but was rebuffed. I remember stating a concern about putting too much faith in the messenger and not enough faith in the message (the Bible). Increasingly, small group became a weekly attack for expressing my independent thinking and I was met with legalism, which Harvest members dish out with ease. The “flock leader” showed up at some of our weekly meetings and I realize looking back, their role was to identify the enemy. For two years now, I have been without a church. The members of my small group do not talk to me at all, nor do my fellow ministry members, both of which I was surrounded by for years. I am a black sheep to be avoided at all cost. A community of “believers” is the last place I would think to go to pour my heart out or grow in faith. I walked away from my faith completely, angry as could be. I have HATED God with a vengeance for what happened at Harvest and for the false community that occurred there. It is only recently that I am coming to a place of returning to God. However, my distrust for the church is likely irreparable and I doubt I will ever again find myself in a community of believers. No, this is not a sin. People throughout the world worship Christ only in their minds for fear of being killed for their faith. I was nobody at Harvest, just one of invisible thousands who filled a seat on Sunday and had a small ministry role. I can say that when I found The Elephant’s Debt I was relieved that I was not alone and that what I perceived was happening really was. Actually, it was so much worse. Spiritual abuse does not just happen at the highest levels at Harvest. It happens to anyone who dares to question aloud anything Harvest. Dave Corning would not remember me, but he is a good person, a loving husband, a good father and an adoring grandfather. I know this because I was in his New Believers class when I first started at Harvest and his life evidenced this in and out of church. He spoke lovingly of his wife and treated her accordingly. The same goes for his family. I wondered why he had disappeared from the church many years before I left. It is a shame how he was attacked. I completely agree. It’s comparable to emotional abuse. It’s silent, but so deadly. It kills your heart and soul. I attended HBC a few years back after being told by many people how wonderful the pastor was. I must say that after just a few services I was appalled by the messages and did not return. Spending an hour listening to Pastor James tell about what happened to him on his great family vacation, or while flying to yet another destination, or the famous people he ran into was incredulous. I literally turned around looking at people raptly listening and couldn’t believe no one found issues with this. The last time I went he had purchased a coffin where everyone was to write something on a piece of paper and throw into the coffin for it to be literally buried in the ground. All that kept going through my head was instead of spending money on such stunts wouldn’t it be more deserving to perhaps help the needier church members with that money. I had no idea this was going on at HBC. I grew up in a Bible church and attended HBC a few years back but left due to witnessing or being an unwilling part of strange situations that went against some basic simple truths of the Bible. I attended one of the HBC satellite churches. If James is doing the Lords work and has been wrongfully accused we all need to pray for this situation to be resolved. If the information provided in the letter posted is true then we need to pray for the truth to win out and for the Lord to provide for it to be used for His glory. I think about the day I will stand before the Lord and on the one hand I can’t wait and on the other I am scared because even though I know I am cover by the blood of Jesus, I am so ashamed of the missed opportunities for the Lord and the people I have hurt and the many sins I have committed. We have to be so very grateful that Jesus has taken our sins away. That is the main focus. If you are worshiping somewhere that you feel is not doing so then of course you need to pray and do as the Holy Spirit directs. Harvest is a huge opportunity for Christ. I hope the leaders such as pastors and elders are indeed following what the Lord is telling them in their hearts. I have seen many people convince themselves that they are doing what the Lord wants, when in realty it is not. I have not listened to any of Jame’s messages in the past few years but I always believed he was very straight forward and honest in his messages. All we need to do is pray that the Lord’s will be done. God is always in control and to him there are no hot-shots here on earth. And pride and arrogance always goes before the fall. If people are taking control over and above the Lord and using his Bride (the Church/the Whole Body of Christ) as their own property or to inflict harm, woe to them. If they are faithfully serving the Lord then they are blessed. James MacDonald posted “Walk in the Word on Television” to his blog (http://jamesmacdonald.com/blog/walk-in-the-word-on-television/) on March 31, 2014. The Christian Post also published “Chicago Megachurch Pastor’s Wife in Tears: I Thank God for Criticism, It Has Sanctified Us” (http://www.christianpost.com/news/chicago-megachurch-pastors-wife-in-tears-i-thank-god-for-criticism-it-has-sanctified-us-121225/), on June 10, 2014, regarding a recent speech by James’ wife, Kathy MacDonald. Kathy MacDonald (June 10, 2014) – MacDonald broke down as she recalled the attacks that she and husband James faced…”Unfortunately I feel like I have my PhD in this topic,” she shared with the audience of the Southern Baptist Convention Pastors’ Wives Conference. Kathy MacDonald (June 10, 2014) – She also said that her husband’s character made them a target for disparaging words. “He is a passionate man and he is a firecracker and he is out there and I love everything about that. But that also means that sometimes there are things that come back at you,” she described. Kathy MacDonald (June 10, 2014) – MacDonald encouraged pastors’ wives…to not allow church members’ barbs to weigh them down. Thanks for posting the excerpts from the recent article with Kathy MacDonald and comparing them with Corning’s words. You’re right, nothing has changed. I attended this church for around ten years, things were good in the early years!, and left when his son, the youth pastor told me that my fears over not feeling Christ were because I just didn’t want to feel Christ and that I was a bad Christian. Never went back. But I wanted to add on to what he said about good people being forced to leave for no reasons. The youth pastor and highschool pastor (this is a BIG church, people) are both his sons that took over the ministries from outstanding godly men with young families, even though they have no experience or even degrees in ministry (at the time.) Both families had to relocate outside of the state, after years of selfless ministry and changing kids lives. Then he sends in his two knuckleheaded kids who encourage gossip, greed, etc., in any conversation they have with the kids they are supposed to be leading. I could go on for hours about his sons, and James, but I’m going to say I’m glad I left the church when I did. Sadly, others have not seen the light and I lost many good friends over my decision, which is thankfully one even the elders are following. – Submit to the Elders in all matters of personal freedom and lifestyle. – Circulate in the lobby before or after all weekend services, except during an emergency. – Clear weekly time in his schedule to meet with anyone in the church requesting an appointment. – Submit for prior approval all requests for ministry outside of Harvest. – Greatly diminish the amount of time he is away from Harvest annually. Given that, as David Corning points out, “James has a big issue with submitting to authority. He once said to me, “I have no problem with authority unless I think it’s stupid”, it’s surprising James MacDonald’s sons aren’t already Elders at Harvest. Shows me both parties may have some fault. I respectfully disagree with you on the salary issue. I’ve been in churches my whole life. I’ve never heard of a church holding a pastor’s church salary confidential. The tithe-paying church members have a right to know how much of their $$ is paying their pastor’s salary and where the rest of their tithes are going. By the way, recently Pastor MacDonald apologized for the way he and his elders handled this situation. I guess God doesn’t speak through him as he and his elders said. Because God doesn’t make mistakes, does He? This was a big one. Them that sin “rebuke before ALL,” that others also may fear. Oh, I agree with you, Charles. I’m not sure if anybody was looking for that kind of detailed information regarding the salary. Was also wondering why you ended this quote from Dave Corning? And why you did NOT quote a little more? When you ended this quote from Dave Corning – Where you did. Do you have another reason for ending his quote where you did? I disclosed to the church board what I did with my salary at the beginning of each new year, including giving. An honest man has nothing to hide. “I cannot stand back and see the godly reputations of former elders and friends be destroyed. “We stand behind Scott Phelps, Barry Slabaugh, Dan Marquardt and others who have asked simple questions that elders are required to ask and to be given full and satisfactory answers. The church discipline being done is just wrong. People should not be disciplined over the Internet and they should not be disciplined for something the elders are assuming they will do. In fact, church discipline in no way applies to these men. These actions are the result of James’ [MacDonald] continuing pattern of using and abusing people. In judging where Pastor James MacDonald’s heart, and the institutional conscience of Harvest Bible Chapel, truly lies, compare the announcement of “church discipline” against the three former elders, from September of last year (https://archive.org/details/JamesMacDonaldHarvastBibleChapel) with the announcement reversing this “discipline”, from September of this year (http://www.harvestbiblechapel.org/10780/blogarchive/blog_id/368679/year/2014/month/9/Blog-Archive). By the same token, there is now an October Elder Update provided by Harvest (http://www.harvestbiblechapel.org/10780/blogarchive/blog_id/368679/year/2014/month/10/Blog-Archive), which reiterates what is clearly the sincere desire of Pastor MacDonald and Harvest’s current Elder Board regarding any further discussion of their sins against the three former elders. “We are grateful for the lessons of this difficult season now behind us”, declares this month’s update, while devoting a substantially greater amount of real estate on this page to “Pastor Appreciation Month”, and how Harvest’s parishioners can express appreciation to their Pastor, James MacDonald. It is, at best, suspicious how the resolution of this dispute between Harvest and the three former elders has apparently reached detente almost exactly one year after Harvest both publicly and relentlessly bore false witness against these three men, in response to their “ask[ing] simple questions that elders are required to ask and to be given full and satisfactory answers”, as David Corning points out. Remember that, as Corning further reveals in his letter, “[Pastor James MacDonald] cannot even give his elders more than a pie chart for the budget of the church”. Attempting to help? Why, then, did Pastor MacDonald preside over what will undoubtedly be seen as one of the most vicious, feral attacks ever undertaken against people of conscience in church history? When the current Chairman of Harvest’s Elder Board, Steve Huston, declared that the actions of these three former elders were “Satanic to the core”, was he being scripted by James MacDonald? Was that also part of Harvest’s Bible Chapel’s attempt to “help” these former elders? Another important element of David Corning’s letter is his revelation that “The elder board…[does] not have any real authority to do anything except carry out James’ wishes”. Furthermore, Pastor MacDonald states that “We delayed making this confession, not wanting to worsen matters as we prayed for a true reconciliation. Praise God, that reconciliation happened meaningfully and mutually this week.” If, in fact, “a true reconciliation” was accomplished, why is it that the outcome of Harvest’s efforts resulted only in the three former elders accepting Harvest’s apology, and agreeing to be “at peace…with Harvest”? It’s not hard to see that the primary consideration of Pastor James MacDonald, and Harvest’s current Elder Board, is a limitation of their liability resulting from their slander against three Christ-followers who were only trying to serve the Lord and defend His church. If it is true that, as noted by one respondent on this blog, “Spiritual parenting will always have to deal with disgruntled children”, are there any adults left in positions of authority at Harvest Bible Chapel? Sean, welcome to SSB. My thought is that he changed his tune on his own elders after being on the BOAA of Mars Hill (and recently resigning) and seeing the Mark Driscoll fiasco go down in a big way. Look at all the $$ Mars Hill has lost in recent months, even closing down churches. Perhaps it was an effort to save his own $$ assets? Interesting the renewed interest in this old thread. Regardless of specific motives, it’s abundantly clear that Harvest Bible Chapel’s institutional commitment is to furiously polishing the outside of its cup and plate. Learned that here in Rochester MN, the head of the Harvest plant came from another church, taking with him a number of young families, and in the process changing his views on spiritual gifts (he went from cessationism to soft charismaticism) and church polity (from congregational to MacDonald’s “episcopal presbyterianism”). His successor’s biggest problem in youth ministry is getting the kids to actually learn some theology. What I glean from this; either HBC is really bad at screening candidates for pastorates, or they’ve got a process which is either inadvertently or intentionally designed to hire people of some flexible theological commitments–and given that those theological commitments are addressed in church constitutions, it would seem that some of these candidates have some selective moral commitments as well, if you catch my drift. It would seem to reckon as well that they may be deliberately choosing those who refuse to teach basic theology. The church is a mess. How is anyone to know who to trust? I thought James MacDonald was a trustworthy man. He sure seemed like one from the pulpit. It is really confusing. How could I have been so easily duped? It hurts to even say that I was b/c that is basically saying I was intentionally deceived. Which makes the betrayal all the harder to believe/accept. James personally told me that me and others who left the church were “duped” by the former elders who left. He put the blame on them. My friend and I both did not get a great impression from our time with him and some of the newer leaders. Some of the other leaders seem like good guys. Is everyone blinded by success? I think I wanted his approval and that is probably why it was hard to both leave and believe the reports that were coming out. Peace. Read Mark’s comments above and in other places on this blog. I think that his comments will help. I recommend him, because he had a history from a church that changed it’s doctrines in a stealth way, over a period of time, and he came to blame himself, too, because he knew scripture, so when he discovered what was going on, he was like, “What the…”, and began to blame himself, because he felt that he should have seen it coming. Juan, don’t blame yourself. It can be hard to see through a guy, especially someone as charismatic as MacDonald. There are whole books devoted to the concept that some people can seemingly get away with anything. But from your note, one “tell” you might practice recognizing is his habit of blaming others for his problems, and of doing so in derogatory terms–you’re saying he basically accused his former elders of lying to cause people to leave the church, no? Other things you can look for; love of money and/or fame, reckless living (like his poker games and 2 million dollar home), sloppy exegesis of the Bible, and the like. Now I’m not saying he’s a psychopath–that has a real specific meaning–but this article (and the book it references) are worth reading when we’re trying to understand abusive leadership. In other words, a lot of people will be able to read and manipulate you, and it’s going to take a “road to Antioch moment” to figure it out. But if you train your “nonsense meter”, you can figure these things out more quickly and reduce your pain. I am beginning to wonder…how pure are our motives in seeking to bring down people in leadership? Are we being rebellious or insubordinate? Sometimes, I am not sure. Maybe that is b/c I do not understand the dynamics of abuse. I also wonder sometimes if I myself am abusive. I hope not! But, maybe I am? How could I know/discern? Peace. If your daughter was being raped, what would you do? Would you stand there and do nothing? Would you shout about it and warn others? Juan, probably best to ask a simple question; if a church leader’s conduct violates the prescriptions in 1 Tim. 3 and Titus 1, who is bringing him down when that conduct comes to light? Is it the accuser, or the church leader? Seems to me that the accuser wouldn’t have anything to do if the church leader’s conduct were, as the apostle Paul clarifies, “above reproach.” No? So it’s not the accuser who brings a man down. It’s the man. Thanks Julie Anne and Bike Bubba. What you say makes sense. I am just saying, could it not also be true, that somewhere in the recesses of our hearts, we lust for the same power they have (or have had)? Is at least some of our opposition or support of others opposition rooted in jealousy and envy of what we don’t have? I wonder that about myself. Maybe I am just making sure I keep in mind the sinfulness in my own heart even as I expose or grieve over the sins of others. Peace. Juan,one could have that somewhere, but the trick is that if I lust for power/money/whatever, that does not in itself impeach my testimony. It means that I do well to do what I’d do well to to anyways; tie my testimony to things that cannot be disputed. And to be honest, I’m thinking that if you’re concerned that you might have that lust somewhere hidden in the recesses of your heart, you really don’t have much to worry about. Rather, I think you’ve been “had” by those who would use insecurity to protect themselves from rightful criticism. I had to learn this the hard way. By trusting, “a leader,” who deceived me saying they had my best interest at heart. Trust NO Man… Over and over, again and again… Trust NO Man..
**but they look NOT unto the Holy One of Israel, neither seek the LORD! Matthew 24:4 …Take heed that no man deceive you. Col 2:4 …lest any man should beguile you with enticing words. John 10:27 MY Sheep Hear MY Voice, I know them, and they Follow Me. One Voice, One Fold, One Shepherd, One Leader. Well – What if leadership is NOT an idea found in the Bible? For one of His Disciples? Then, maybe, it’s NOT bringing “down people in leadership.” But, it’s admonishing leaders, warning leaders, the postion “leader,” is NOT in the Bible for one of His Disciples. And now, they have to make a tough decision. For you have “ONE’ leader – Christ. And NOT one disciple did. Are getting the wind knocked out of them – being humbled… Yes? Are they one of His Disciples? I attended Harvest Bible Chapel for several years, became a member and actively served in one of its ministries. During that time, I believed I had found my spiritual home. Regrettably, I left Harvest knowing I would never be able to trust any of the Pastors, Lay Leaders or anyone else in positions of authority there. While I was discouraged and filled with both self-doubt and self-condemnation as I was leaving, I now realize God was rescuing me from the sinking vessel known as Harvest Bible Chapel. The fact that He delivered me before the current maelstrom makes me even more grateful. To demonstrate how unhealthy the culture at Harvest is, it is fair to describe the Pastor in leadership over the ministry I served there as incompetent. Ultimately, betrayal and humiliation was visited upon me at the hands of this Pastor, who tasked Lay Leaders serving under him with “handling” me. I believe it was the incompetence of this Pastor that led him to believe it was appropriate to shame me. Fortunately, I was not alone in my assessment of him; this Pastor apparently left Harvest not long after another serving in his area of ministry escalated complaints about him to one of Harvest’s Elders. More recently, this same Pastor has apparently returned to Harvest, and is serving in another ministry leadership role. Doesn’t the Bible say that a dog returns to its own vomit? Ironically, I recently saw one of the aforementioned Lay Leaders in services at the church I now attend. In fact, I see a fair number of people from Harvest I knew personally, or knew of, in services at that church. Sean, thanks for sharing your experience at Harvest Bible. I’m glad you were able to leave with your faith intact. Some do not after such an experience! Sean, if I might beg you to characterize your experience more specifically, you might help others that way. My experience with MacDonald was peripheral–my former church was using his material–and what I noted in his work was weak exegesis (e.g. using Isaiah 58 to justify ritual fasting–it does the opposite), apparent love of money, waffling on the importance of the Trinity (Elephant Room 2), and political moves (abuse of power) to cover up for all that. Others I know characterize HBC in terms of rushing people to the baptismal before they really understand their salvation, and still others have accused them of sending a lot of kids to local Christian schools who really didn’t know Christ. So if you can take the general “incompetent” and translate that into specific things related to theology–you’re coming close when you note that you were being monitored by lay leaders and such–you could help people affiliated with HBC to understand what’s wrong and help them to repent of that sin. Might be hard, I know, but if you can, you might be a huge blessing to a lot of people. I started attending in 2013, during the “scandal.” I see nothing to charge this man with. I see him as selfless in the way he teaches. His books outline his self-admitted shortcomings. He preaches with authority and arrogance may be his personal struggle. He wrote many books and has the radio/tv ministry he could have made millions from, but the profit goes to the church/ministry. I don’t know his situation, nor does it affect me or Gods ability to work through me. You think pastors are perfect? You feel like shaming someone on social media is glorifying God? I take personal offense to someone discounting what God has done and all the good that has come from HBC. This is why I have no faith in church in America…and it has very little to do with imperfect pastors and everything to do with the hearts of people in the church. If James is some self-serving false prophet, how can he teach Gods word every week? How can God do so much through HBCs ministry? Why would God do so much through an evil spirit known as James MacDonald? I think you should worry about yourselves and take your concerns to the Lord. There may be a little pride in your hearts. 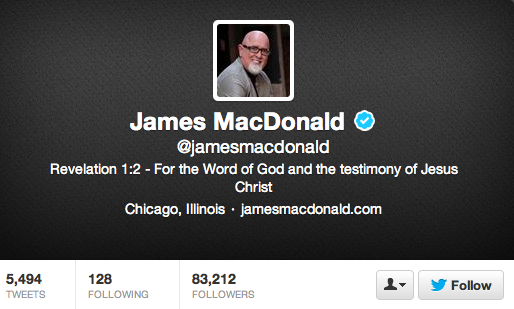 Everyone I’ve met from HBC are sold out followers of Jesus, not followers of James MacDonald. As an example, I really dislike the Catholic Church. I feel it’s teaching and theology is off-base. Yet they still profess Jesus as Savior. So I’ll let God worry about that. I won’t go online and bash the church. I will do my best to stand up for the faith, based on what the bible says. It would only serve to deter and hurt the cause of Christ. Think about why were here and what our purpose in life is…and I’ll bet you’ll see how futile your efforts are to bring down one man. Lord, Lord, didn’t I do this in your name, didn’t I do that in your name? Get away from me, I never knew you. How come you do NOT follow your own advice? Did any of His Disciples call themselves pastor/leader? Did any of His Disciples have the “Title/Position” pastor/leader? for you have “ONE” leader, the Christ. Is James teaching God’s word? when he calls himself pastor/leader? What are all them books that he wrote about? Did Jesus pass out pamphlets or tracts, sell books, CD’s, DVD’s? Did anyone write books of the Bible for profit or for sale for donating the proceeds to the church, or to pay for per diem for their travel expenses? Which Apostle had a college education? What did he think of his own education? According to the Catholics, if you aren’t in their church, you are a heathen. So, they preach Jesus, huh? Most ex-Catholics that I know, they tell us that they don’t preach Jesus. They preach “church fathers”, not Jesus. Well, I gotta say that I sort’a disagree a little bit. If you look at each and every signer of the Declaration of Independence, they came from all sorts of differing Christian beliefs, not agreeing with each other, crack pot or not, which is why I posted the words of Ben Franklin. He knew that there was differing beliefs out there about God. And he was OK with that, and why? Because he had differing beliefs. He didn’t know who was telling the truth, or telling lies. In regards to paying for doctors and such, Boston Tea Party! We the People have the right to revolt against a tyranny. We are the militia, but some don’t want us to be well armed. But then again, it can be argued that we the people allowed those laws to be passed, because we the people were not being represented by our representatives, and yet, we elected them. Whose fault is it, in the end? We the people. We were dumb enough to let it happen. John, your naiveté is alarming and typical of those who are biased towards celebrity pastors. I know. I was where you are at several years ago when we blindly followed a celebrity pastor. That is, until we began to examine him in light of the Word of God. Jannes and Jambres (2 Timothy 3:8, KJV) withstood Moses and mimicked the miracles God did through him. The false prophet will work miracles and deceive those who have received the mark of the beast, (Revelation 19:20, KJV). “13 For such are false apostles, deceitful workers, transforming themselves into the apostles of Christ. Matthew 7:15-20: 15 Beware of false prophets, which come to you in sheep’s clothing, but inwardly they are ravening wolves. Not everyone that attracts a crowd is being used by God. And many religions that name the name of Christ, teach salvation by works and not solely by faith. Men who enrich themselves by the “ministry” are false prophets, such as was Balaam. Please, examine behavior in light of the Word. Pray for discernment. Test everything that is taught in light of the whole counsel of God’s Word. John, my response to you is simple; Mr. MacDonald has accepted a modalist explanation of the Trinity from T.D. Jakes in “Elephant Room 2”, lives in a two million dollar home, hid his income from his own elders and put two of them out of fellowship when they challenged him, takes a majority vote on the elder board (he is effectively a bishop), and in my experience, takes some dubious theological stands, like semi-endorsing the prosperity theology of T.D. Jakes. So in my view, he’s got some problem with being a “lover of money” and being “quarrelsome”–he does not appear to be gentle. Now as I read 1 Timothy 3, there is a list of qualifications, and “apt to teach” (which I’d also contest, having read through “Authentic”) is only one of them. So it is entirely possible for a man to appear to be a great teacher of God’s Word, and yet be entirely unsuited for church ministry. For Mr. MacDonald to be suited for Gospel ministry, I would suggest the following changes. 2. Restore the excommunicated elders to the eldership. 3. Give up his 50% vote on the elder board. 5. Apologize for some of the errant teaching he’s done–e.g. “Authentic” on fasting, service, and the like, as well as his endorsement of prosperity theology and failure to recognize the modalism of T.D. Jakes in Elephant Room 2. One final thing that would be brutal, but necessary, for him would be for him to move from a “megachurch” setting to a church of 2-500 people where he can actually minister to congregants. A shepherd doesn’t just talk to the sheep for an hour each week. James MacDonald is not a shepherd. We’re talking James MacDonald, Elizabeth. Nice point but wrong person, if I’m reading you right. Please correct me if I’m missing something, and blessings to you. Pastor James Macdonald led me to Christ and walked me through what I need to do to be accepted and forever forgiven by Jesus. He has done the same for at least thousands of other people. That is exactly what the Bible commands us as followers of Christ to do. Explain to me what you do that is better than what Pastor James does? To my knowledge, Julie Anne has never claimed to do anything “greater” or “better” than James MacDonald. She hasn’t compared herself to him at all. As far as I can tell, she’s only working to give a voice to those who’ve been abused, so that the abusers don’t get to control the conversation. So, just because MacDonald led you to Jesus, do you think that excuses him badmouthing his former elders, and lording it over his own flock by making himself unaccountable? Or that spiritual abuse is “worth it”, as long as “thousands” are led to Christ? Many defenders of Driscoll and C.J. Mahaney seem to take that line. I don’t find it any more convincing — or Christlike — from them, either. Brian, that article was written after McDonald and his elders spiritually abused other elders. Later, he eventually apologized publicly and to the elders he harmed. I think James himself would correct you and say that he was not acting appropriately then. I accepted Christ as Lord and Savior of my life during the early 1990’s. I was led to the Lord by a Pastor, began attending his church, and was a member there for nearly seven years. During that time, I received counseling and discipleship from this Pastor, both of which I benefitted from greatly. As I began growing in my faith, and became more active within the church, I began to see how my getting closer to the Lord exposed how unhealthy that particular church was. Ultimately, the same Pastor who led me to the Lord years earlier, developed the expectation that I would assist him in facilitating an arrangement for his receiving compensation from the church. That “arrangement” is most accurately described as money laundering. When I understood the extent to which I could have been both personally and professionally implicated in this unethical, if not illegal, conduct on the part of this Pastor and his church, I realized I had no choice but to walk away. I also had to realize that this Pastor was not God, that his church was not sacrificed for my sins, and that I had to learn to not only choose, but welcome, the Lord’s leadership in these matters over that of other people. Today, the church where I accepted Christ as Lord and Savior more than 20 years ago, now appears to have been abandoned. Several years ago, I was told by someone attempting to resuscitate this church that my former Pastor cleaned out the church’s bank accounts, to the tune of tens of thousands of dollars, before making a hasty exit. I drive by this church sometimes, perpetually amazed that the place where my spiritual life was born is now spiritually dead. By the same token, I walked away from Harvest Bible Chapel after having been a member there and also having actively served in one of Harvest’s ministries. During that time, I believed I had found my spiritual home. Regrettably, I left Harvest knowing I would never be able to trust any of the Pastors, Lay Leaders or anyone else in positions of authority there. Once again, I was being called to realize that neither James MacDonald nor any other Pastor at Harvest is God, that neither Harvest nor any other church was sacrificed for my sins, and that I had to learn to not only choose, but welcome, the Lord’s leadership in these matters over that of other people. It’s now abundantly clear that Harvest Bible Chapel is on the same destructive path the church I was saved in over 20 years ago descended down into its current abyss. The relevant question here is not who is better. Rather, as stated in Romans 3:23, “…all have sinned and fall short of the glory of God…” If I have learned anything in more than 23 years as a Christ-follower, it is that trusting the Lord necessarily means having a healthy degree of skepticism about both the intentions and ultimate objectives of church leaders, particularly Senior Pastors. James has been arrogant for a long time.His biblical knowledge is lacking.This man needs to be humbled. Harvest Bible Chapel run by racists and antisemitism. I came to Christ sixteen years ago. Fourth generation American of Jewish heritage. Unlike Pastor James who comes from Canada. They wanted to segregate me Nazi Bastards. Truth always comes to the light and I praise God for the truth of James MacDonald being exposed. I have been a member of Harvest since summer of 2005 and will conitinue until the Lord guides me otherwise. Many of us who choose to remain are doing so in faithfulness to God. We did not “follow” James M., we follow and serve the Lord. To read comments in the news that Harvest is a cult is just pure evil. We are not a cult, we are followers and believers in Jesus Christ. The members who choose to stay do so in prayerfully waiting on God to move and rebuild His church. To restore the body of Christ and bring those woundered back to faith in Him. Thank you for continuing to expose false teachers everywhere. I only ask that the news stop referring to the church as a cult. The body of Christ who remain at Harvest are not a cult. We are Christ followers.